The thermal toughening process allows monolithic curved glass up to 2400 wide x 2300 tall. This is often the lightest-weight and most economical curved-glass solution, and has capability for variable radius, slight double curvature, and printed blackout frit. The visual quality of the glass is higher than competitors’ roller-hearth processes, which tend to leave roller marks and uneven curvature of the glass. Sag bending is a horizontal process, which can be used for glass up 2500x 3200mm. This allows options for chemically toughed and laminated solutions (lighter, stronger safety glass solutions), tighter bend radii, more complex shapes (including significant double curvature), very thick glass, and does not leave tong marks on the glass edge. 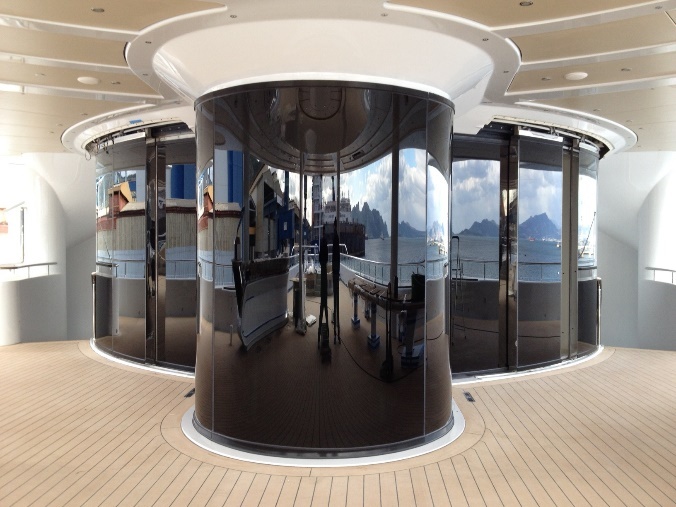 The quality of Trend’s glass matches the highest demands of the yacht industry. 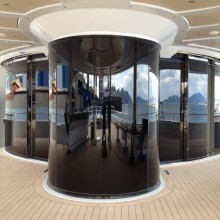 The curved glass can also be made into IGU’s.